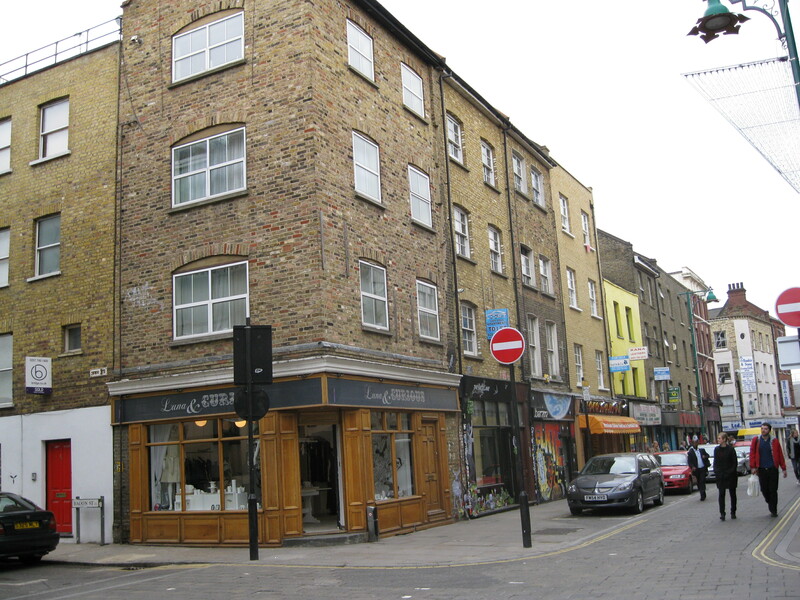 The north end of Brick Lane, from the Truman Brewery, all the way up to Bethnall Green, is the frontier of edgy art, fashion and retail. Artists, including the Britpack’s Tracey Emin, have worked in the area since the 1980s. Galleries have grown around them. 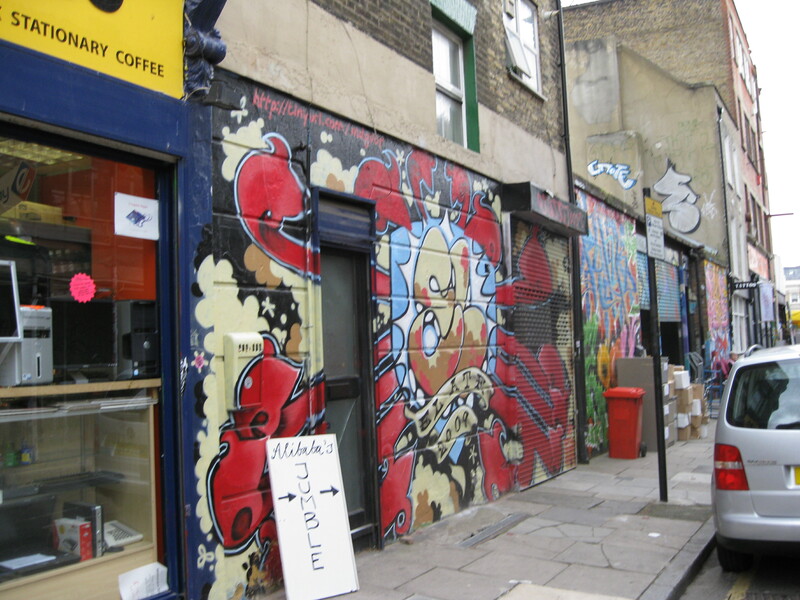 In this stretch of the street, establishments like Brick Lane Gallery, Luna and Curious and NOG, champion contemporary and street art by newcomers. Walls and underpasses feature Graffiti by masters like Banksy, D*Face and Jet Aerosol. Up here, the old Rag Trade, first founded by the Huguenots centuries ago, forges a bold path forward. The Laden Showroom, which supports innovative young designers and dresses celebrities like Pete Doherty and Victoria Beckham, is London’s leading fashion showroom. Vintage stores have new twists. Alongside Rokit’s racks of military regalia, cowboy boots and ball gowns, are original t shirts and crafted jewellery. Tatty Devine’s quirky accessories marry retro dreams to modern possibilities. Furniture stores and cafes take wood and coffee breaks in new directions. At Unto This Last, planks morph into unbelievable shapes as shelves, CD racks and fruit bowls, while at LCD Surf shop punters can surf the net, buy a t shirt, take a board for a dry run, watch surf videos and drink fair-trade, organic coffee. 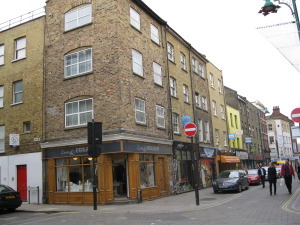 Also out here, on the cutting edge, at glaring odds with their avant garde neighbours, are two of Brick Lane’s oldest businesses, survivors of its Jewish past. The Beigel Shop, “London’s first and best beigel shop” was founded in 1855 and the Beigel Bake was one of the city’s first all night eateries. Customers still come from all over London to queue for their traditional, crisp beigels. 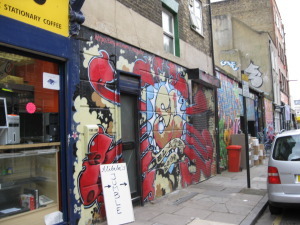 So, if retro, graffitti and innovation are your thing, head north on Brick Lane you won’t be disappointed!